Find the perfect spot for your next selfie on one of our piers or at a waterside park. With sailboats in the background or a postcard sunset, it’ll be your favorite souvenir. In the Mobile area, Chickasabogue Park is a 1,100-acre outdoor recreation facility and wildlife refuge near the clear, cold Chickasaw Creek. It provides a wide variety of outdoor activities in a natural setting while protecting the environment and preserving the diversity of plants and animals indigenous to the area. The Park offers camping, canoeing, hiking, fishing and swimming. Fairhope’s picturesque Municipal Pier is one of those places that looks like a postcard. This well-known and oft-photographed, oak-lined path and park sits atop a bluff on Mobile Bay and is truly a transporting and awe-inspiring place to walk or relax. 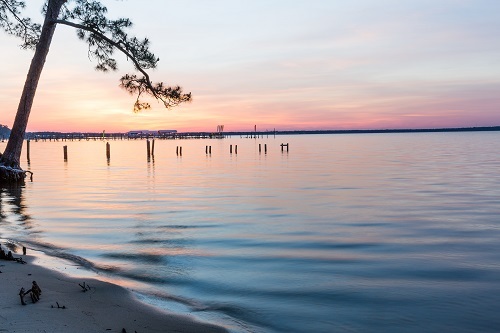 Spanish Fort’s 5 Rivers Delta Resource Center is not only a hot spot for canoers and kayakers, but it also boasts 1.5 miles of bayside trails, perfect for a rigorous walk or a leisure stroll. Visit the piers at Daphne’s Bayfront Park, Mayday Park or Village Point Park Preserve. They provide beautiful bay views, picnic areas, pavilions, sandy beaches or playgrounds. Take a tour of some of the most unique places on the Delta by exploring North Baldwin’s Live Oak Landing, which offers access to the historic Bottle Creek Indian Mounds and four other sites along the Alabama Coastal Birding Trail. The Landing site includes new boat ramps, weigh station, fishing piers and floating docks. Gulf Shores is home to the second longest pier in the Gulf of Mexico: Gulf State Park Pier. Come out to the pier before dawn and watch as the sun rises over the water. Then, enjoying a morning fishing on the pier’s 2,448 ft. of fishing space. Rent fishing gear and buy bait on the pier as well as your fishing license. There are often informative ranger walks on the pier, too. Located on scenic Wolf Bay, Orange Beach Waterfront Park is another beautiful place to spend the day on Alabama’s beaches. The park is opened year-round and includes a 400 ft. fishing pier, covered pavilions, picnic shelters, grills and a kid’s park with slides, swings and a climbing area. Foley’s Graham Creek Nature Preserve offers trails and water-access to some of the most pristine rivers and waterways in Alabama, where people flock to enjoy canoeing, kayaking or hiking along the quiet, serene creek. The Preserve also provides a variety of exercise stopping points near natural gardens, children’s nature class installments and more. Enjoy a lovely, peaceful walk across the beautiful bridge to Dauphin Island. Spend a few hours learning about the waterways of the Gulf Coast through aquariums, touch tanks and more at the Dauphin Island Sea Lab’s Estuarium. Explore Dauphin Island’s East End Park, Pier and Boat Launch or the public beaches on both east and west ends of the island to see nature and beauty along water-side boardwalks. Enjoy fishing, swimming, picnicking or just exploring nature.